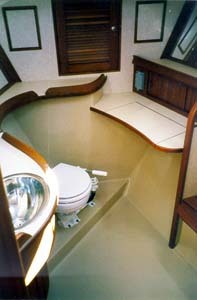 This nice anchoring arrangement is on the bow of the Hunter 450. Cleats are provided in the anchor locker for the line, the windlass is hidden out of the weather and a partition separates two anchor lines. Too bad the bow roller fitting is so flimsy. This is the forward head (one of two) arrangement in the Island Packet 45. It is roomy and well furnished yet compact and located in the bow where it doesn't impede on other living spaces. 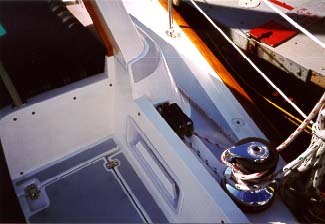 The keel bolting arrangement on the J/125. 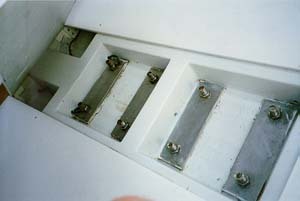 The keel flares at the hull to allow a wide bolting base. Also notice the large backing plates. The grid structure carries the loads. However, this boat has no bilge sump. Looking forward inside the J/125. Contrast this with the Farr 40 and you can see this structure relies on longitudinal stiffeners, rather than transverse. 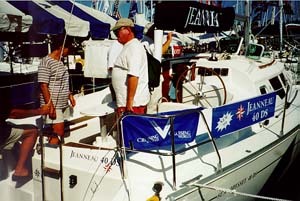 The unstiffened areas are much smaller than those on the Farr 40. However, I think this boat may be carrying a little more extra weight in the ends. 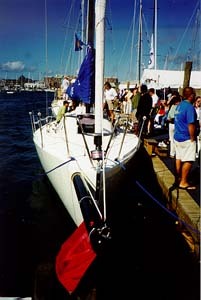 rig and asymmetrical spinnaker mean planing speeds. 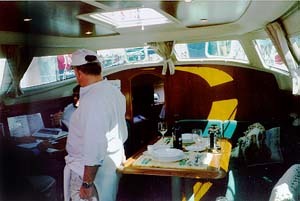 The galley of the J/32. 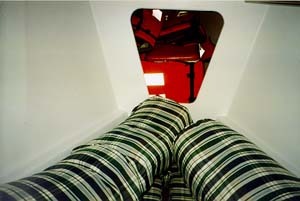 This picture features the access from the main cabin into the cockpit locker. This is an excellent idea that lets you reach gear in way in the bottom of the very deep locker. Note that the stove is right next to a bulkhead which makes it difficult to use. 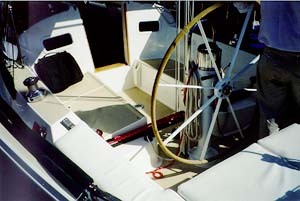 The wheel and mainsheet arrangement of the J/32. 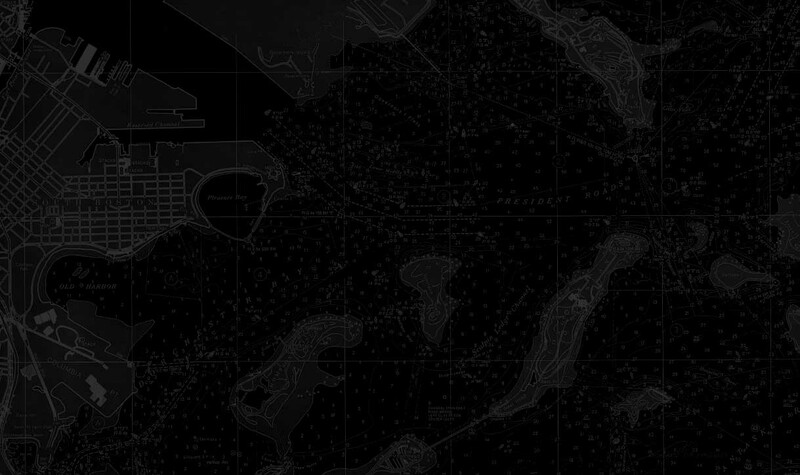 By putting the traveler controls and main sheet near the helmsman, he can control the main easily in gusty condition. Frankly, the trend of putting these controls on the cabin roof make them practically useless on other boats. The trade-off is that you can't put a full cockpit bimini on this boat and keep it up while sailing. Billed as a live-aboard cruiser, the Jeanneau DS40 features a raised salon and with expansive cabin windows. 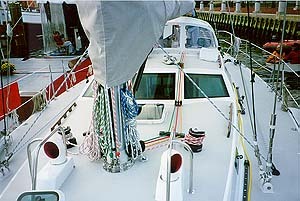 As can be seen here, the cockpit takes a cue from cruising catamarans with the wheel located on the aft cabin bulkhead. 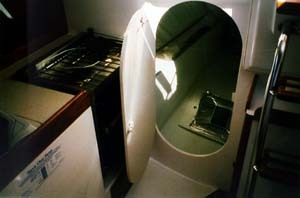 This leaves the after part of the cockpit open for a table and socializing area, out of the way of sail handling controls. The interior of the Jeanneau DS40 is huge, thanks to the raised salon and beamy hull, but I think the dinette dominates the space, to its detriment. Unfortunately, there is no inside steering station, but I suppose an autopilot with remote control could be rigged. they are impossible to inspect. The Little Harbor 56 with a pilothouse. 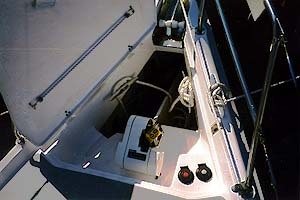 Enclosed within the pilot house is a small dinette, settee, and steering station. The steering station uses a joystick connected to the autopilot and bow thruster. While a nice addition to the boat, this pilothouse really shrinks the living space below. 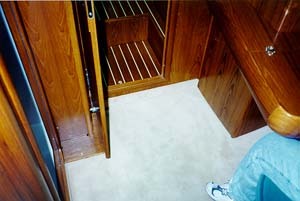 The low profile of the house, coupled with the aft cockpit, results in little cabin space aft of the companionway. Effectively, this boat feels 10 feet shorter below. Sail control lines on the Little Harbor 56 lead through the sides of the pilot house to line stoppers at the forward end of the cockpit. This makes them reachable from the cockpit and the pilothouse, a nice touch. I did not check the accessibility of these lines from below, but I imagine they would be hard to reach. 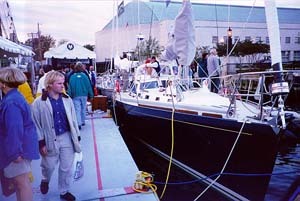 The Morris 48-6 was commissioned by an avid racer who wanted a dual purpose boat; one that was fast on the race course and easily cruised. 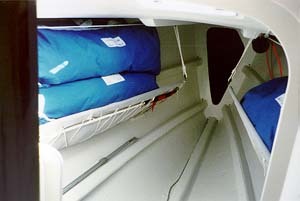 The boat has a sensible interior arrangement, with real pilot berths, and a great deck arrangement. The forepeak of the Morris 48-6. Just visible on either side of this picture are longitudinal stiffeners that run the length of the topsides. This hull-deck joint is bonded and fiberglassed, without mechanical fasteners. Considering the reputation of the builders, I don't consider this a liability. After all, don't we rely on non-mechanical bonds for the rest of the structure? 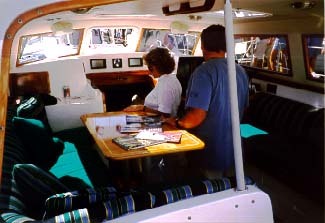 boat has a raised salon, rather than a true pilothouse.